Google Chrome 7 stable version has been released and it is already available for Windows, Mac and Linux. The latest version is Google Chrome 7.0.517.41 to be precise. Sticking to its promise of 6 month release cycle, Google Chrome has released Google Chrome 7 for Windows, Mac and Linux users a day ago. The latest release brings in hundreds of bug fixes and other improvements. There is a major boost to speed as well. According to Google, the latest Google Chrome 7.0.517.41 comes with a number of bug fixes, an updated HTML5 parser, and file API and directory upload via input tag and a number of new features. Apart from these enhancements, the new Google Chrome 7 closed a number of major security holes as well. You can find more information at Chromium Security page. If you are already using Google Chrome in your Ubuntu, all you need to do is a "sudo apt-get upgrade". As you all should know already, Google Chrome automatically installs Google repository in Ubuntu and hence you get the latest Google Chrome updates without doing anything new. Otherwise you could simply download the latest Google Chrome 7 from here. Browser wars has never been so intense and it seems the real winners are going to be the open source browsers. I have been using Chromium and Firefox for years now and it's really heartening to see them winning against the much bigger rival. 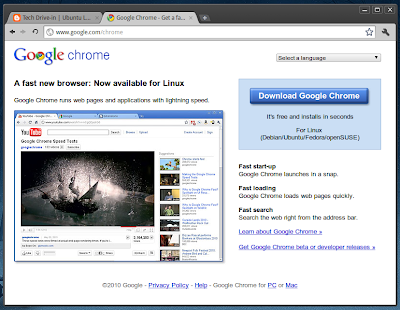 On a final note, you may also want to learn how Chromium is different from Google Chrome.